Pizza is something we sometimes save up for, meaning a ball of mozzarella cheese allowed to sit in the fridge for a few days while other ingredients accumulate as leftovers. When the mood suddenly strikes, my wife the baker launches into a frenzy of kitchen activity, making the dough, proofing the dough, assembling toppings, sometimes making a sauce. Since one of our favorite pizzas is topped with caramelized onions and blue cheese, the process also involves a long, slow simmering of onions on the stove top, filling the house with that unmistakable caramelization aroma. Last night the pizza maker was foraging in the fridge for all kinds of leftovers to go on the pizza. 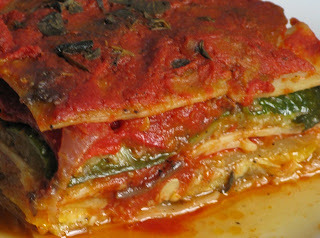 The one in this picture was made with previously frozen spinach, along with the remains of a tin of roasted red peppers and a fairly ancient tomato sauce. There were also two kinds of chicken pizza--one with barbecue sauce--caramelized onion without blue cheese, and daughter's favorite, pepperoni and cheese. We were even able to enlist a container of previously grated Parmesan cheese. Not a bad night for cleaning out the fridge. I may have previously mentioned that my wife makes the world's best pizza crust. We like it thin, just a little chewy and more on the well-done side. If you are so inclined, here is the recipe for the dough. It will make four medium-size pizzas, plenty of room to display all your leftovers. And you'll have tomorrow's lunch as well. 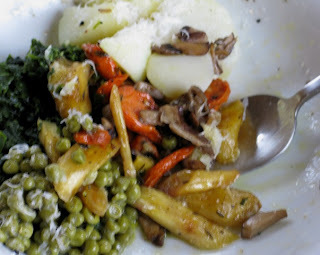 Roasted parsnips and carrots, boiled potatoes, chopped spinach, sauteed mushrooms, canned baby peas. Drizzle with extra-virgin olive oil. Season with coarse salt and freshly ground black pepper. Dust with leftover grated parmesan cheese. And I don't mean figuratively, but quite literally: Someone has been leaving eggs on our doorstep. The first carton appeared a couple of weeks ago and we chalked it up to one of those curious things that sometimes happen in the big city. 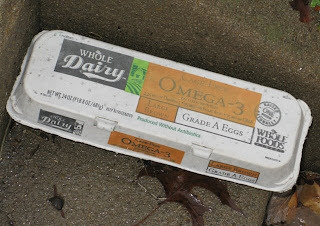 But then we found a second carton of eggs (pictured here) sitting on the steps just inside our front gate. We suspected that our mysterious egg gifter might be our farmer friend Mike Klein. We've been pestering Mike about getting a delivery of some of his farm-fresh eggs. Maybe we'd be seeing an invoice soon? But when I e-mailed Mike, he insisted it wasn't him. "I'm not that generous," he said. Then last night we found not one but two quart-size cartons of soy-based yogurt--one stacked on top of the other--sitting on the same concrete step where we'd found the last batch of eggs. What the...? My wife suggested I check the "sell by" dates on the yogurt and the eggs. Perhaps these weren't so much gifts as just cast-offs someone was trying to dispose of with us. Sure enough, the "use by date" on the eggs had expired. I did not check the yogurt: that went directly into the trash. Since that time, we occasionally find a plastic grocery bag on our stoop containing banana peels. Could she have graduated to leaving eggs and yogurt? Who buys so many eggs and so much yogurt that they need to dispose of whole cartons? So far we have kept the eggs over the objections of our daughter, who fears they might be poisoned (such is the world we live in, I guess). If you are the giver of these items and you are reading this, you should know how much we appreciate the thought behind your donations. 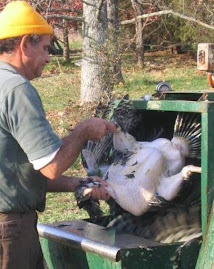 But you should also know that we do not compost eggs or yogurt. 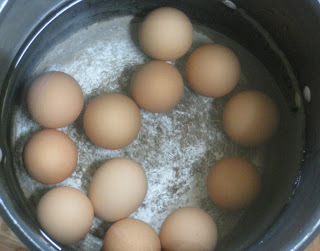 The eggs we plan to hard-boil. If I had a pig, I would feed the yogurt to it. But in the absence of a pig, the yogurt unfortunately is headed for the landfill. Where would mankind be without beans? 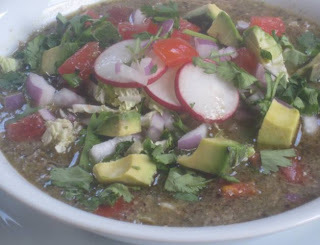 Beans are loved the world over in flavorful bean dishes and in processed foods such as tofu. They're full of fiber and iron and lots of protein. But as the kids in our "food appreciation" classes learned this week, beans do not provide the complete protein needed to grow healthy bodies because they lack some important amino acids. That's why beans are so often paired with grains such as rice and corn. Not only do grains taste great with beans, they bring the required amino acids to the table. The proliferation of bean and rice dishes around the world is no accident. As we continue our virtual food road trip, we made our way to South Carolina where the "low country" once was an important source of rice in America. You can still find lowcountry rice, but its importance to the nation's food basket has faded. What lives on is a bean and rice dish traditional to the region called "Hoppin' John." 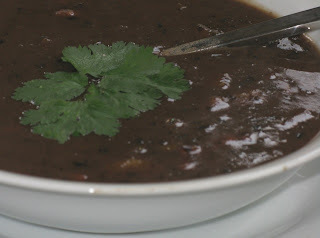 This is a very simple dish made by cooking the beans in a pot with onion and ham hock, then adding the rice to cook in the flavorful broth. An easier one-pot dish could hardly be found, and this one is very kind on the budget as well. Hoppin' John falls into the category of poverty food, yet like so many traditional country dishes, this one is so delicious and so satisfying. 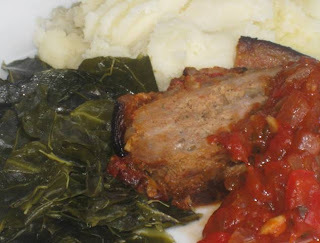 This recipe comes from a book appropriately titled, Hoppin' John's Lowcountry Cooking, written by John Martin Taylor. It's a book worth owning for the many simple, hearty dishes we associate with this particular region. The cooking time required for making Hoppin' John is a bit longer than we have in our "food appreciation" classes, so I made the dish ahead. 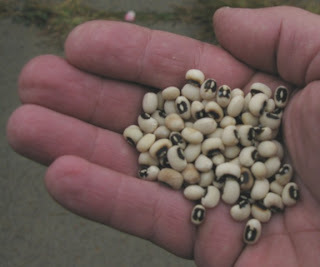 What the kids did was shell the beans we had growing in our garden, as shown in the photo of blackeyed peas above. I brought the whole plants--brown and dessicated--to school in a recycling bin. Kids are funny. Sometimes the simplest things will occupy them totally. They go from being utterly unteachable one minute, to completely absorbed in the task of shelling beans the next. Normally I use brown rice for nutrition, but white rice is traditional for this dish. You might try using brown basmati rice--it's not quite so brown and does not take too long to cook. Pick over the beans to remove any stones or damaged beans. Add them to a heavy pot with the water, removing any beans that float. Add ham hock and onion. Bring pot to a boil, then reduce heat and cook, uncovered, until beans are tender, about 1 1/2 hours. Add rice and cook until tender. Remove pot from heat, cover and allow rice to steam another 10 minutes. Serve warm, preferably with some boiled greens (the vitamin C in the greens helps absorb the iron in the beans) and a slice of corn bread. Just to illustrate how important rice and beans are around the world, a parent came up to me while I was washing the cook pot after our lesson and exclaimed, "Oh! You're making a rice cookup." I must have given her a quizzical look, because she went on the explain: "That's what my mother always called it, 'rice cookup.' She'd make it just like that--beans and rice, some beef tripe and coconut milk...."
Turns out the parent grew up in Guiana. Not so far from South Carolina, it seems. When I'm throwing a party and not feeling very rich I often put a potted cheese out for hors d'oeuvres. This is one way to turn an economical slicing cheese into something exotic looking that spreads on a cracker. Potted cheese is simply cheese grated and marinated in beer, then spiked with dried mustard and Worcestershire sauce and blended fine. Scrape it into a small bowl and guests will think you are an entertaining genius. (You don't have to tell them you're just trying to save a few pennies.) It has the added virtue of keeping almost indefinitely in the refrigerator. To make this potted cheese, I used two kinds of cheddar, one from Vermont, the other from England, one orange, the other yellow. In general, I prefer a sharp cheddar cheese for flavor. This particular recipe is from Fancy Pantry, by Helen Witty, one of our favorite sources for making tangy dishes out of fresh produce and odd bits. Grate the cheese and combine it at the bottom of a mixing bowl with the mustard and the beer. Press the cheese down until it is covered by the beer, cover the bowl and let it stand for a few hours or overnight. 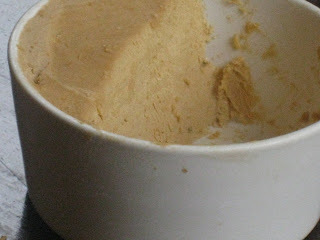 Place the softened butter in a food processor and process until creamy. Add the cheese mixture, Worcestershire sauce, white pepper and cayenne. Process everything until the mixture is smooth, scraping down the side of the bowl occasionally as needed. Taste and add more seasonings as you desire, as well as some salt if it needs it. Pack the cheese into a crock or ceramic bowl. 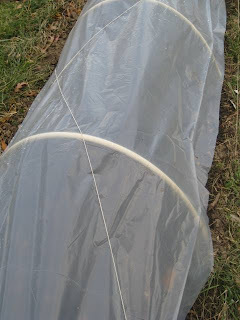 Smooth the top and cover with plastic wrap. For longterm storage, cover the cheese with clarified butter to a depth of about 1/4 inch, then cover the container and refrigerate. Serve at room temperature, but leave the cheese out of the refrigerator long enough to soften. Crackers or toasted baguette are the perfect accompaniment. 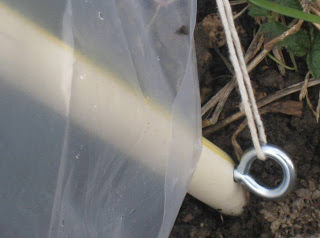 We planted potatoes this fall as an experiment. And look how happy the plants are! Much happier, I should say, than they were during the summer. 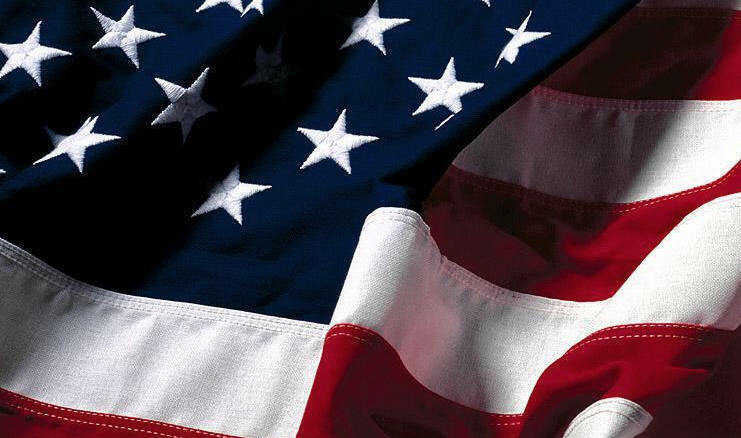 Summers in the District of Columbia are typically so hot and humid, especially July and August. 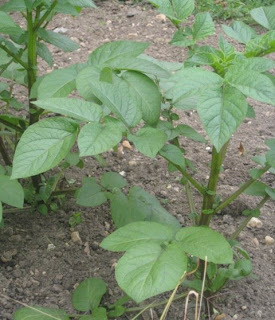 In truth, potatoes are a cool weather plant, unlike their cousins, tomatoes and peppers. Most other plants love this time of year: the Swiss chard, for instance, have never looked better. The rhubarb are in the pink of health. 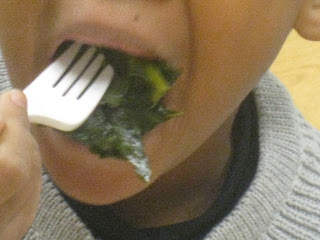 The sorrel, the thyme, the rosemary--they are all flush with vigor and vitality. I wish I could give our garden more weather like this. 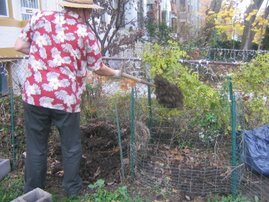 There is an added benefit to the garden: the pests and diseases that might otherwise bother our crops are in full retreat. 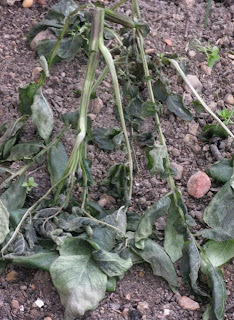 Of course the potatoes will not stand up to a hard freeze. 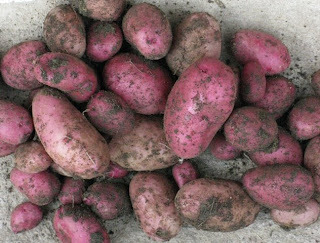 We are hoping they will last long enough to at least make some small potatoes that we can cook for dinner. 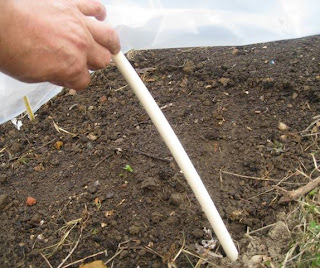 This week I was weeding in the potato bed--yanking all that chickweed that also loves these cool temperatures so much--and came across several seed potatoes that are sprouting, but so far have not broken the surface. It will be fun to watch their progress. We have all these sweet potatoes harvested from the garden and sweet potato pie was pencilled in as dessert for our choucroute dinner. But as so often happens, making this pie would not be as easy as--well, pie. We first had to have a discussion. than a pie from the legendary Bill Neal and a book with sweet potato pie right in the title? But my wife was not convinced. As she so often does in these situations, she first wanted to check Bill Neal's recipe against the one in The New Best Recipe, the tome from Cook's Illustrated that my wife considers her recipe bible. Sure enough, she started picking Bill Neal's version apart, piece by piece. Too much molasses. Not enough egg. Dry sherry--huh? My wife thinks I'm crazy not to be in love with The New Best Recipe. My main beef is, the authors seem to be less interested in authenticity than in their own idealized vision of how certain foods should be. Using their personal bias as a starting point, they then weed through recipes from hither and yon, adjusting and changing them as they go until they arrive at something that more or less matches their preconceived notions. Apparently, that suits my wife just fine. And being a man of a certain age, I've learned that beating your chest is useless. The female species is always right. It's wiser to just submit. 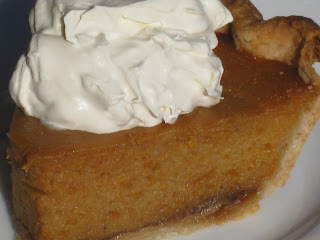 Hence, sweet potato pie from The New Best Recipe, wherein the authors seek "to create a distinctive sweet potato pie, a recipe that honored the texture and flavor of sweet potatoes while being sufficiently recognizable as a dessert. Neither a custardy, pumpkin-style pie nor a masked-potatoes-in-a-crust pie would do." Prick the sweet potatoes several times with a fork and place them on a double layer of paper towels in a microwave (I bake my sweet potatoes at 325 degrees in the oven). Cook at full power for 5 minutes, turn each potato over and continue to cook at full power until tender but not mushy, about 5 minutes longer. Cool 10 minutes. Halve a potato crosswise, insert a small spoon between the skin and flesh and scoop the flesh into a medium bowl. Discard the skin. (If the potatoes are too hot to handle, use paper towels as a wrapper.) Repeat with remaining sweet potatoes. You should have about 2 cups. While potatoes are still hot, add butter and mash with a fork or wooden spoon. Small lumps of potato should remain. Whisk together the eggs, yolks, sugar, nutmeg and salt in a medium bowl. Stir in bourbon, molasses and vanilla. Whisk in milk. Gradually add egg mixture to sweet potatoes, whisking gently to combine. Set aside. Process flour, salt and sugar in a food process until combined. Add shortening and process until mixture has the texture of coarse sand, about 10 seconds. Scatter butter pieces over flour mixture, then cut butter into flour until mixture is pale yellow and resembles coarse crumbs, with butter bits no larger than small peas, about 10 1-second pulses. Turn mixture into a medium bowl. Sprinkle 4 tablespoons ice water over mixture. Use rubber spatula and folding motion to mix. Press down on dough with broad side of spatula until dough sticks together, adding up to 1 tablespoon more ice water if dough will not come together. Flatten dough into 4-inch disk. Wrap in plastic and refrigerate at least 1 hour or up to 2 days before rolling. Remove dough from refrigerator and let stand until malleable. Roll dough on lightly floured surface into a 12-inch circle. Transfer dough to a 9-inch pie plate by rolling the dough around the rolling pin and unrolling it over the pan. Working around the circumference of the pie plate, ease the dought into the pan corners by gently lifting the edge of the dough with one hand while gently pressing it into the pan bottom with the other hand. Trim the dough edges to extend about 1/2 inch beyond the rim of the pan. Fold the overhang under itself; flute the dough or press the tine of a fork against the dough to flatten it against the rim of the pie plate. Refrigerate the dough-lined pie plate until firm, about 40 minutes, then freeze until very cold, about 20 minutes. Adjust an oven rack to the lower-middle position and heat the oven to 375 degrees. Remove the dough-lined pie plate from the freezer, press a doubled 12-inch piece of heavy-duty foil inside the pie shell and fold the edges of the foil to shield the fluted edge. Distribute 2 cups ceramic or metal pie weights over the foil (my wife used some pennies in addition to her pie weights). Bake, leaving the foil and weights in place until the dough looks dry and is light in color, 25 to 30 minutes. Carefully remove the foil and weights by gathering the corners of the foil and pulling up and out. 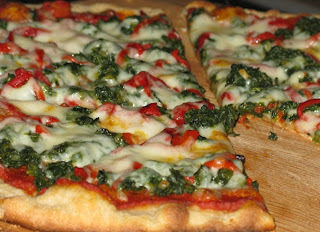 For a partially baked crust, continue baking until light golden brown, 5 to 6 minutes. Transfer to a wire rack and reduce the oven temperature to 350 degrees. 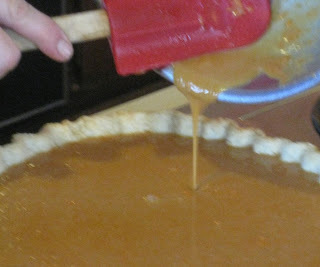 While the crust is still warm, cover the bottom with 1/4 cup packed dark brown sugar and the pie filling. Pour pie filling over the brown sugar. Bake on the lower-middle rack until the filling is set around the edges but the center jiggles slightly when shaken, about 45 minutes. Transfer pie to a wire rack and cool to room temperature, about 2 hours, before serving with your best whipped cream or vanilla ice cream. The brown sugar creates an unexpected layer of flavor at the bottom of the pie. We knew the pie was just right when our friend Pete, a West Virginia native who has an unerring taste for home-cooked food, sat bolt upright at the dinner table and nearly dropped his fork. "Dang, that's good!" Pete exclaimed. "How did you do that? Mine is almost always flat." Heart experts--using terms such as "ground-breaking" and "paradigm-shifting"--are hailing a new study indicating that inflammation, not cholesterol, may be the reason for much of the world's heart disease and that statin drugs should be prescribed for many people whose cholesterol levels are otherwise normal. The study, involving 18,000 volunteers in 26 countries, concludes that most people might benefit more from taking a $20 blood test that measures high-sensitive C-reactive protein (HSCRP), an indicator of heart inflammation. The Washington Post quotes all kinds of experts calling this study nothing short of the Rosetta Stone where heart disease is concerned. But anyone who's been reading Nina Planck or Sally Fallon knows there's a whole movement of folks who never bought into the cholesterol theory of heart disease and have insisted all along that inflammation--caused by an industrial diet overloaded with Omega-6 fatty acids from processed corn and soybean oils and other factory foods previously unknown to humans--is the real cause of our modern heart disease epidemic. Many experts, in fact, have congregated around the belief that cholesterol from saturated animal fats as a cause of heart disease is unproven and largely a myth. The Washington Post makes no mention of these longtime advocates of the alternative inflammation hypothesis. But I'm guessing there are quite a few Weston Price followers experiencing an Ah-ha! moment this morning. Why don't we all make ourselves a big bowl of whole-fat, grass-fed yogurt and ponder that. 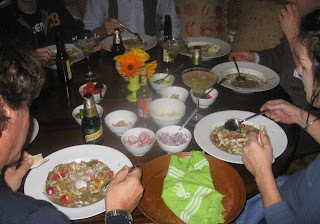 Choucroute as a recipe is less important than the people you invite to eat it with. So thank you Linda, Tom, Larry, Valca, Pete and Steve for joining us last night. Since we were all basking in the glow of Tuesday's election results, this also constituted our Kumbaya moment. Choucroute is a classic Alsatian dish of sauerkraut and pork products but there is no single agreed-upon way to make it. In other words, don't feel you have to make it exactly as written in your picture book of French cookery. 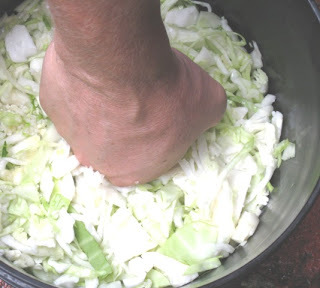 My own method starts with home-made sauerkraut, shown in the photo at left beginning with about 10 pounds of shredded cabbage and six tablespoons of pickling salt packed firmly in a heavy plastic bucket so that the brine that leaches from the cabbage rises over the top. Give it a month or more to finish. I then hop on the subway to Capitol Hill to select my pork products from the local butchers: a smoked hock or shank, bacon ends, smoked chops, fresh pork belly if they have it and Kielbasa sausage and bratwurst. Then I get back on the subway and head downtown to the Cafe Mozart where the deli case holds weisswurst and lots of other goodies. Being made of veal, I'm not sure how traditional weisswurst is in choucroute. But we love it and so do all our guests. The day before the event, I saute a large onion with some bacon grease at the bottom of our biggest and heaviest cookpot. Cook it until it is soft and lightly caramelized. Then I grate two Granny Smith apples (with skins) directly into the pot before adding about six cups of fresh sauerkraut. I stir in a teaspoon of caraway seeds and about a dozen crushed juniper berries. Then I push my smoked ham hock deep into the middle of the kraut, pour in a half cup of Riesling wine and bring the whole mess to a boil. Reduce the heat to the lowest setting, cover the pot and let it simmer for an hour or more until the kraut is soft, aromatic and unctuous. But for this particular choucroute, there was something special: sauerruben, or fermented grated turnips, that have been mellowing in our refrigerator for the last year and a half. They have an other-worldly nutty flavor to go with the mild tang of fermentation. I added about two cups of that to my pot as well. The results were beyond anything we've ever experienced from mere sauerkraut. While the pot is simmering, brown all of your other meats in a heavy skillet with a little cooking oil or bacon grease. These can be wrapped and refrigerated until the following day, when the sausages, the bacon ends, the smoked chops and the pork belly are all packed into the pot to wait until the guests arrive, when we turn the heat up to a gentle simmer and let those kraut and wine juices steam everything for about 45 minutes. We loaded the finished kraut and meat onto a big platter and served it buffet-style with roasted parsnips and carrots from the garden, mashed potatoes and homemade apple sauce. All of the guests had brought various German wines and the libations did flow. Conversation was lively, interrupted by exclamations over the turnip-infused kraut. For dessert, we plated a stunning sweet potato pie made by my wife the baker from sweet potatoes grown just outside the kitchen window. More about that anon. I am still recovering. 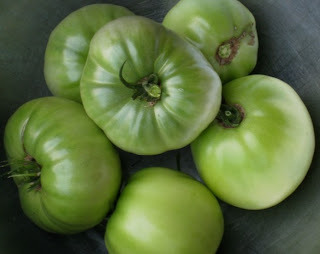 Can you believe we are still processing green tomatoes? Our final harvest netted us a bus tub full of green tomatoes plus another bus tub full of tomatoes in various stages of ripeness. Here it is November and we are looking for new and different ways to use our green ones. We love our sweet pickled green tomatoes and green tomato and apple chutney. In our latest search, we came across this recipe for green tomato, apple and pear mincemeat in Helen Witty's Fancy Pantry. It sounds an awful lot like the green tomato chutney, but with sharper flavors: lemon, pear, allspice, cloves, ginger and rum. Besides serving our green tomato chutney as a condiment, we like to spread it on a cracker with goat cheese. I see a similar destination for this meatless mincemeat, which also would be perfectly fine in pastries and such. This recipe makes about eight pints, which is a lot. You could easily halve it and can the mincemeat in half-pint jars for holiday gift-giving. Combine drained tomatoes with apples, pears, raisins, orange zest and pulp, lemon zest, vinegar, apple concentrate, sugar, cinnamon, allspice, cloves and ginger in a preserving pan or heavy, non-reactive pot. Bring mixture to a boil over moderately-high heat. Lower heat and cook, uncovered, stirring often, until mincemeat is thick enough to mound in a spoon, about 1 hour. Take care to stir often and scrape the bottom to prevent burning. Stir rum (or Calvados) into boiling-hot mincemeat, cook a minute or two longer, then ladle into hot, clean canning jars, leaving 1/2 inch headspace. Remove any air bubbles (I poke around the mincemeat and stir gently using a long wooden skewer). Seal jars with new two-piece canning lids according to manufacturer's instructions and process in a boiling water bath for 25 minutes (for pint-size jars). Let mincemeat mellow for about a month before using. Note: you can also store the mincemeat covered but not sealed in your refrigerator. For the second stop on our virtual world culinary tour, the kids in my "food appreciation" classes traveled to the Appalachian region of western North Carolina. Sometimes it's hard to distinguish between Appalachian fare and what we loosely refer to as Southern Food. Sometimes the two intertwine. Corn is a staple of both and corn meal--the basis for hearty corn bread--in ubiquitous in this part of the country. Think grits, hush puppies, spoon bread--we could devote a whole book to this one particular grain and how it permeated the soul of America's one true cuisine. My go-to reference for Southern baked goods is the classic Biscuits, Spoonbread, and Sweet Potato Pie, by Bill Neal. 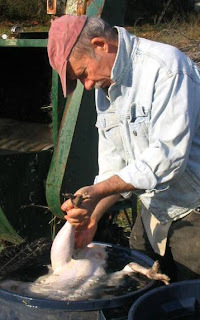 Originally from South Carolina, Bill Neal made a name for himself as a restaurateur in Chapel Hill, NC, with his wife Moreton Neal, then went on to become something of a scholar where Southern food is concerned before he died too young at the age of 41 from AIDS. Neal included no less than seven recipes for corn bread in Biscuits, Spoonbread. What they all have in common is corn meal, of course, and an iron skillet in which to bake the bread. Frequently, the recipe also calls for buttermilk and a chemical rising agent, such as baking soda and sometimes baking powder. These are the essentials of true, Southern corn bread, not the cakey, overly sweet stuff you so often see in cafeteria lines. A corn bread souffleed with beaten egg whites would be the kind of thing you'd put out when company came for dinner. 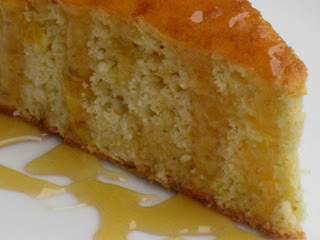 (In fact, this is a variation on something Bill Neal called "Company Corn Bread.") Mainly, what I wanted the kids in our "food appreciation" classes to appreciate is the role rustic corn meal plays in our food culture and how it can be manipulated with a few simple ingredients into something ethereally delicious. In some Southern households, it was customary to have at least one heavy iron skillet on hand devoted to making corn bread. From frequent use, the skillet would become well-seasoned and non-stick. You may not have an iron skillet devoted to making corn bread. If you don't have an iron skillet at all, can I suggest getting one? It is a great kitchen tool, something we use all the time. You could serve this bread with your favorite barbecue, with a bowl of Southern greens or beans, a salad or just an afternoon snack. 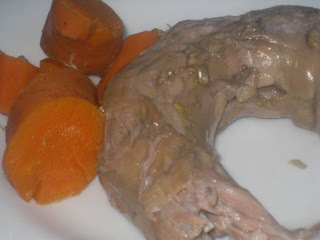 If possible, serve it warm, perhaps with a drizzle of melted creamery butter or some local honey. I'm not the baker in the family--that would be my wife. But I can make this sweet potato bread, which should prove that anyone can do it as well. This is a versatile bread with a light taste of sweet potatoes, just the thing to help us use that huge haul of sweet potatoes we made from the garden recently. I made some for our recent "food appreciation" classes where the kids spread slices of bread with fresh apple butter. That's another great combination. The first thing my wife noticed about this loaf was that I'd screwed up the braid. Oh, well. I guess I was AWOL when they were giving braiding instructions. But with an egg glaze nicely browned in the oven, no one really notices. This bread is especially good toasted for breakfast. I've been snacking on it lately, smeared with blue cheese. 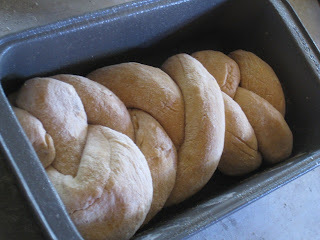 The recipe, which I initially posted here, makes two loaves that can be braided or not. Start eating one now and freeze the second loaf for later. Another suggestion: consider replacing some of the all-purpose flour with whole wheat flour.